She'll look stunning wearing this Dolce & Gabbana Girls Mini Me Ortensia Sun Dress featuring an illustrated hydrangea print. Inspired by the Dolce & Gabbana Women's Fall Winer 2017 Collection, this is beautiful way to dress a special girl. 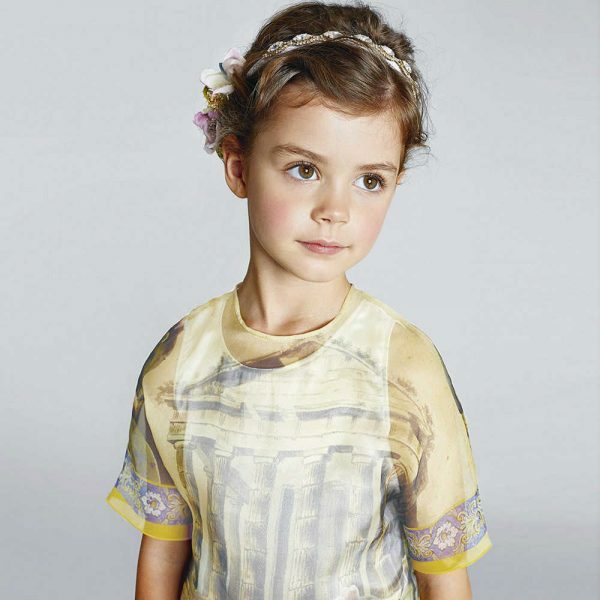 The wonderful mini-me print brings the senses alive with the scent of fresh flowers. There are spaghetti shoulder straps and ruched bodice, with a full and flared skirt. Looks great with this DOLCE & GABBANA Girls 'Ortensia' Canvas Bag featuring an illustrated hydrangea print. An elegant way to accessorize a beautiful outfit. This mini me design evokes the scent of fresh flowers. The handles are canvas, with pink leather trims and there is a magnetic closure. Don't forget a matching pair of Girl Ortensia Hydrangea Print Sandals.